Do you have trouble eating healthfully when you’re traveling? 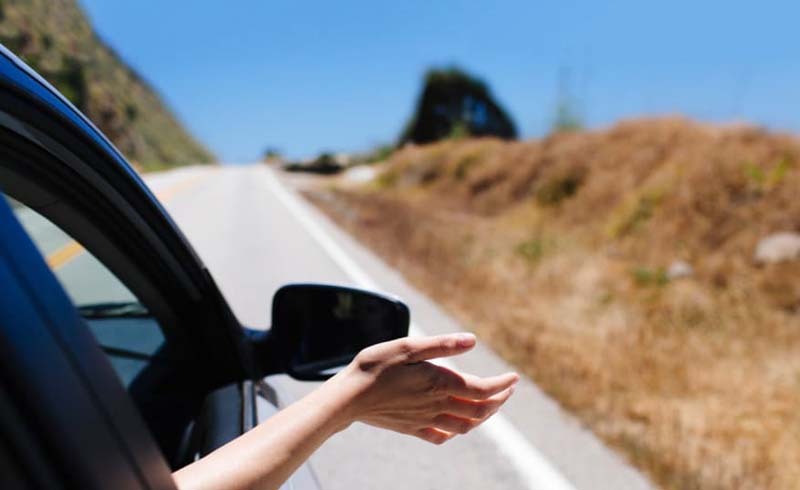 These easy tips will help you stick to your diet when you’re on the road. Sometimes travel feels like a nutritional obstacle course as you dodge giant cinnamon rolls, pizza, soft pretzels, and 40-ounce, frozen coffee drinks at every airport and rest stop. But you don’t have to eat junk when in transit. With a few simple tips, you can hit the road and leave the indigestion behind. If you start your trip hungry, you’re going to find yourself with two hands full of doughnuts before you can say “flight delay.” Fuel up with a healthy breakfast before you leave the house, or pack one to go. If you’re flying, individual bowls of ready-to-serve oatmeal can pass through security and just require a hot water fill-up from a coffee bar or flight attendant. Choose a plain or reduced-sugar variety so you don't overload on the sweet stuff, and pack a baggie with wholesome ground flaxseeds, chia seeds, or hemp seeds to sprinkle on for more flavor and an extra nutritional boost. Or create a breakfast bag with a banana, Justin’s individual almond butter packets, homemade granola bites, and/or a hardboiled egg. Squeezable yogurt tubes are only 2 ounces and are perfect for when you’re driving or can easily be taken on a plane, too. Stock your backpack with grab-and-go treats that aren’t artery-cloggers so when hunger strikes, you have something satisfying on hand. Think: protein bars, whole-grain crackers, Skinny Pop or low-cal popcorn, reduced-sodium jerky, dried fruit, trail mix, and nuts. If you have a cooler filled with ice or a mini-fridge in your hotel, stock it with low-fat yogurt, pitted green olives, fresh fruit, hummus, and Babybel cheese so you won't be tempted to order a high-calorie meal from room service. Try to eat a little something every two to three hours so you're never starving. If you let yourself become famished, that's when you'll be most vulnerable to give into temptation and buy a splurge meal like a bacon cheeseburger with fries. Buy a lunch bag with an ice pack and bring it with you on your journey. Then plot out your day of traveling and see where you’re going to be and when. Will you be on the road for lunch and/or dinner? A little planning goes a long way. Make a whole-grain wrap with turkey, lettuce, tomato, onion, and mustard and a side salad ahead of time—and then bring it with you. And bring along a refillable water bottle, which you can fill up at water fountains. Drinking water will help keep you feeling full without costing you any calories. Taking a road trip and want to try some healthy, local fare? One of these apps may be just what you need. Load Food Tripping, a GPS-based app that searches out local, sustainable food spots wherever you may be roaming. For those with food allergies or those who are vegan or gluten-free, both the Clean Plates and Healthy Out apps filter local restaurants to find one that fits your preferences. Stuck in an airport? Use GateGuru to learn about your terminal’s food choices, so you’ll know that there’s a salad spot just past security (and you'll be less likely to succumb to the first grub that you see). Have your own tasty tips for eating healthfully on the road? Share your fail-safe strategies in the comments, below.